On The Town is a 1949 MGM musical film, based on the Broadway stage production of the same name, about three sailors on shore leave in New York City-- "for just one day." While we've been to New York City as a family a number of times, we'd actually never stayed in the city once. Until this trip, that is! 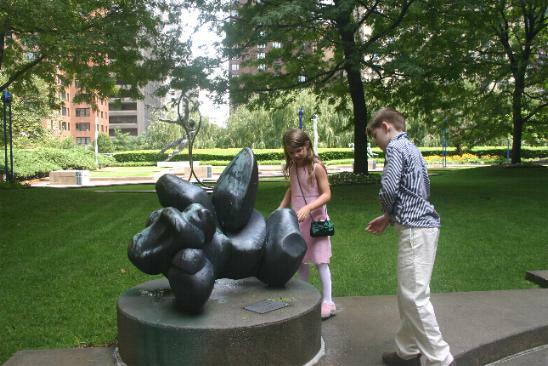 These digital images were taken on August 11 and 12, 2008. 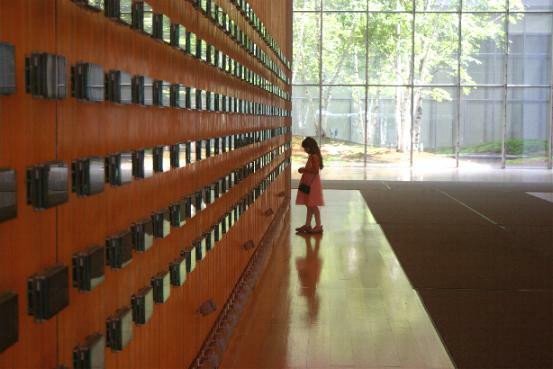 Thalia Elizabeth takes in the "Movable Type" display in the lobby of the new New York Times building on Eighth Avenue and 41st Street. In this construction, headlines and other fragments of the newspaper's actual content are continuously displayed in small monitors across two 20 x 53 foot grids. Fascinating! 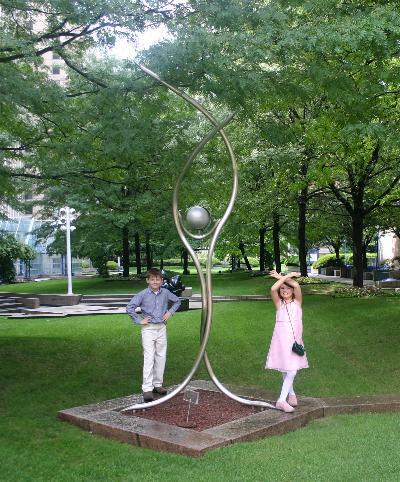 Moving uptown a bit but still on the West Side, Kieran and Thalia ham it up on the plaza of the "vertical campus" at which I got my Bachelor's Degree. It wasn't nearly this green when I attended! 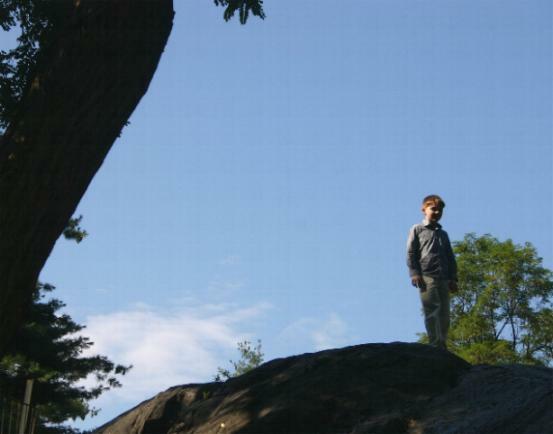 By the way, have you figured out where this is yet? 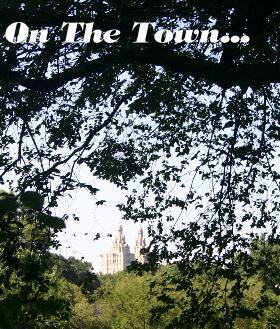 Hint: In the background is West 61st Street, looking towards Broadway. One of the somewhat lesser known icons of Manhattan, but still a landmark of sorts. 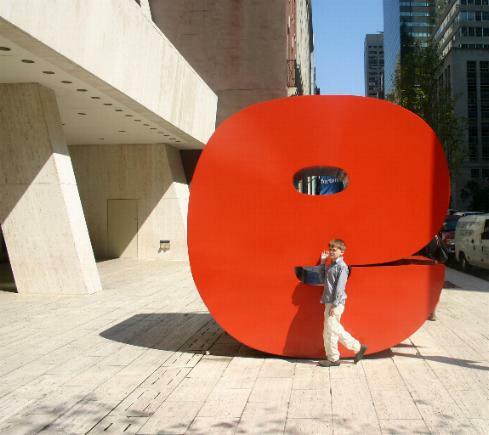 No, it's not really an "e", but a "9", as in 9 West 57th Street. Kieran poses at the place where my brother and I did as children, many years before. The skyscraper was erected in 1974, and not without controversy (search on "9 W 57" for more). Its curtain wall facade curves skyward off to the left of the photo. Oh, and notice it's sunny out! That's not the way the day started, believe me! 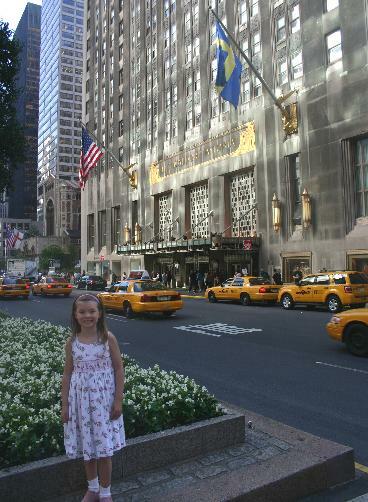 Not Eloise, but Thalia at the Plaza! 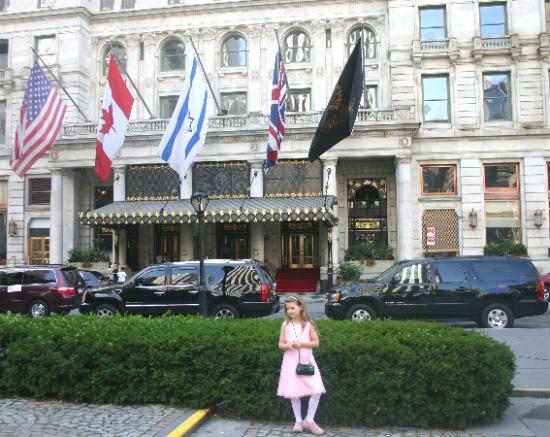 At the corner of Fifth Avenue and Central Park South, The Plaza is still among the most elegant of all hotels, but it is all now home to luxury residences-- luxury as in, "if you have to ask how much it costs, you can't afford it" (A quote attributed to J.P. Morgan). We could at least afford a walk through the recently restored lobby. But don't worry, we did OK for the night, as you'll see in a moment. The title image was also taken from roughly the same place in the park. OK, so we couldn't stay at The Plaza. Would the Waldorf-Astoria do? Yes, thanks to quite the "hotel loyalty points" sale for the off-season, we were able to get a night's accomodation at another of the world's most famous addresses. The fact that this photo of Thalia was taken at 8:30 in the morning on a Tuesday illustrates that even Manhattan does have an "off-season"! It was difficult for me to believe how "non-busy" the city was during our stay. 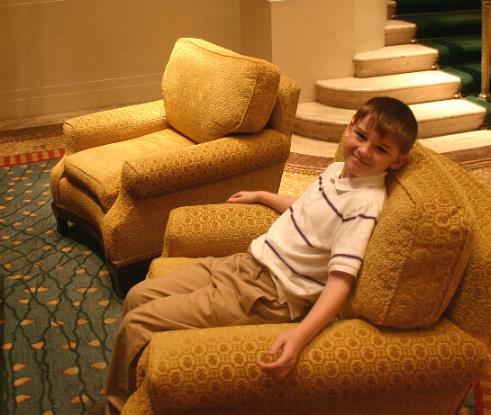 "I like the chair," says Kieran, of one of the many posh furnishings in the Waldorf's lobby. The "George-proof" camera setting was working a lot better this time! This is an available light shot. And we close with a shot looking south along Park Avenue. 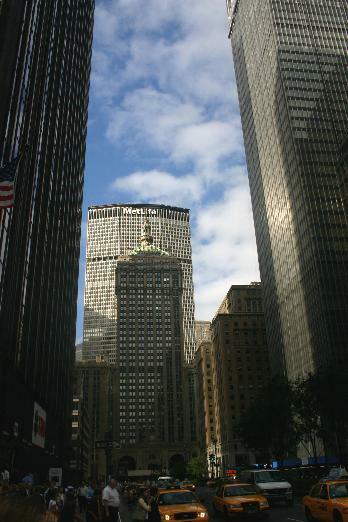 I may refer to the "Met Life Building as the "Pan Am Building", and the taxis may be newer than they were when I was a kid (or even when I was in college!) but the energy of the Big City remains. We, however, had to go, with more memories created and more left to do the next time we'd be On The Town.